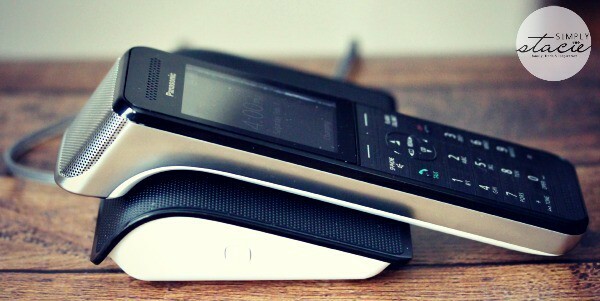 The Panasonic DECT Premium Design Series of cordless phones may just be the coolest phones ever. I’m not kidding either! I’ve never seen phones that could do as much as these ones can. 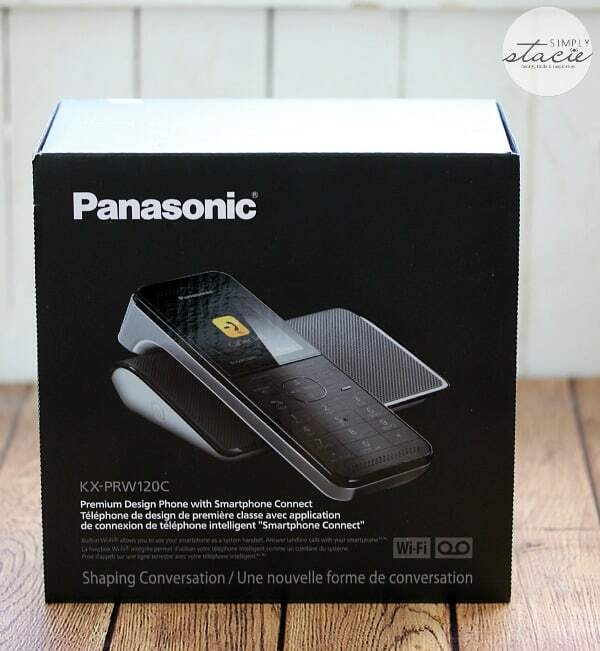 Panasonic Canada sent me a DECT Premium Design Phone with Smartphone Connect (Model No. KX-PRW120C) to use in our home. Previously, we’d been using a basic cordless phone with no bells and whistles. We could talk on the phone and that’s about it. This new DECT Phone amazed me with all its neat features. Plus, it’s a snazzy looking phone too, don’t you think? I can’t wait to fill you in on all my favourite features of this phone. Let’s get started…. 1. It’s stylish & functional. 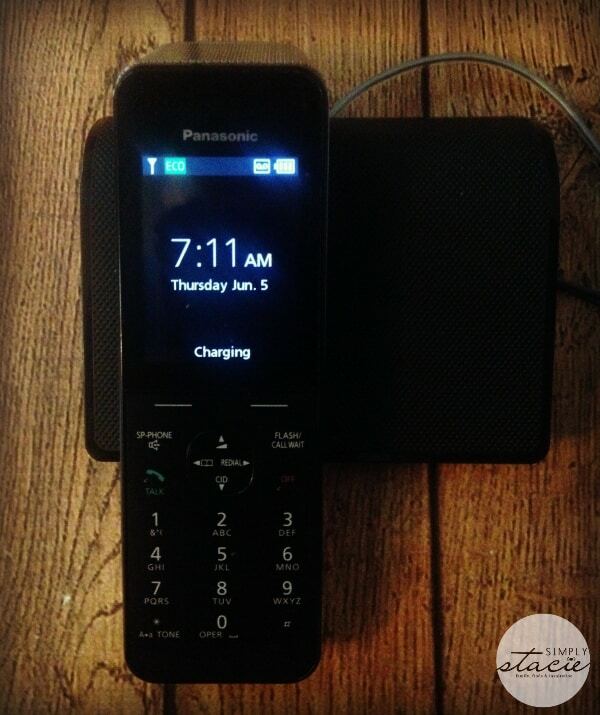 The Panasonic DECT’ Premium Design Series phone’s sleek design blends in perfectly with our decor. The phone itself feels solid, but still is lightweight to hold. It doesn’t feel cheap like some other phones I’ve owned in the past. It’s also very comfortable to hold and talk on the phone. My mom and I can spend an hour on the phone at a time. I’m normally doing other things around the house while chatting with her. This phone is perfect for multi-taskers! 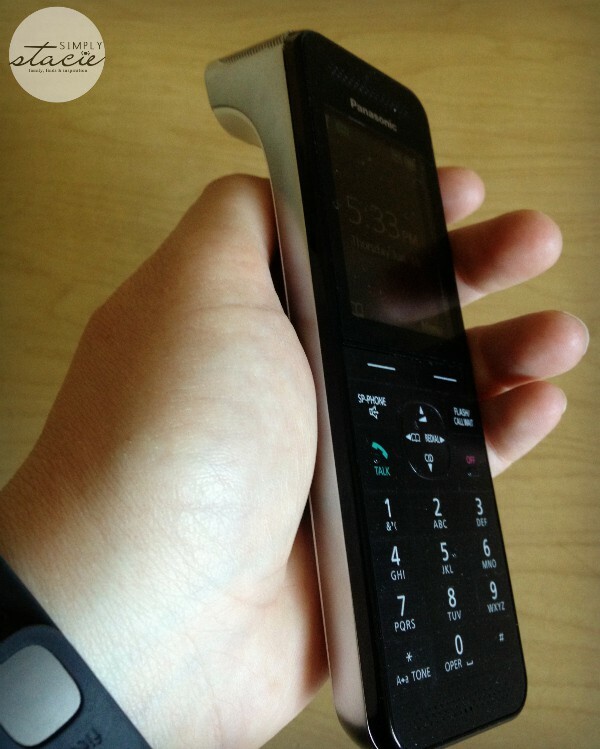 Speaking of multi-taskers, the design of this phone makes it so simple to use with one hand. Because it lays down on the base face up, you can easily dial with one hand without even picking the phone up. This would have been very handy to have around when my daughters were babies and I always had one of them in my arms. I can definitely see why this model was an honoree at the International CES Innovations 2014 Design and Engineering Awards. 2. Two words: Smartphone Connect. I had no idea that Smartphone Connect even existed. Smartphone Connect is built-in Wi-Fi that allows you to use your smartphone as a system handset. What this means is that I can now receive and make calls through my home number with my iPhone or tablet! My iPhone acts like another handset. It’s very simple to set up. The instruction manual walks you through the steps to connect the base to your home Wi-Fi. Once that is connected, download the free Smartphone Connect App either on iTunes or Google Play. I opened up the app and it immediately recognized the model of phone that I had and I was good to go. When my home phone rings, my iPhone rings and tells me that a call is coming through Smartphone Connect. It even shows me who is calling. It’s neat because I don’t have to go out and buy more handsets to use around the house since there’s no shortage of smartphones here. You can register up to 4 smartphones or tablets so it’s less likely that you’ll have to waste time trying to find a handset to use. 3. Call transfer with no disruptions. You can transfer calls to another handset, smartphone or tablet during the call. With teenagers this feature is very handy! I can answer the phone with the handset and then transfer it over to my daughter’s smartphone for her to continue the call. 4. Built-in All-Digital Answering System. There’s no need to pay your phone company extra money for Call Answer because the phone comes with its own advanced answering system. It can record 37 minutes recording capacity and can store up to 64 messages. When you receive a voicemail and you’re not home, you’ll be notified by your smartphone to check your messages. If you’re home, you’ll hear the base unit beep to let you know that there is a new a message waiting to be checked. Oh yes it does. The first time I heard this it scared me because I wasn’t expecting it. If you have Call Display through your phone company, you can use this feature. 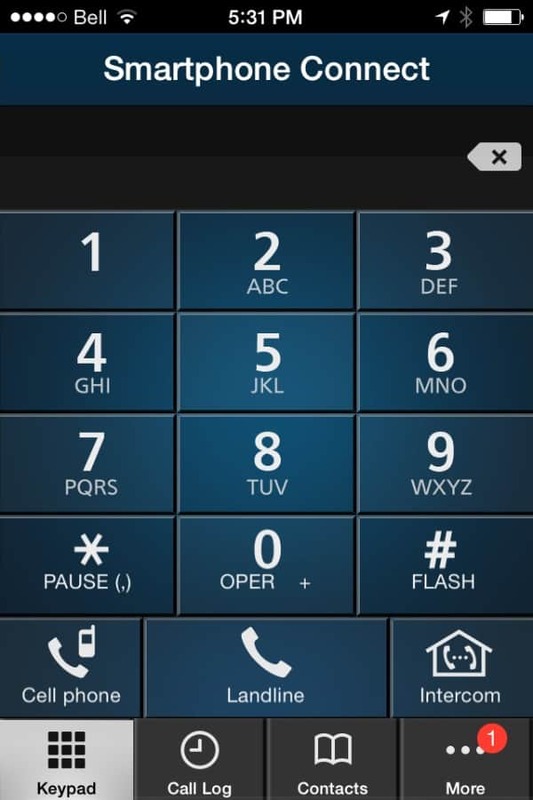 Not only will you be able to read who is calling, but the phone will also tell you the name of the person calling. The voice is robotic like you’d hear on the GPS in your vehicle. This feature is so handy! If I’m busy doing something and the phone rings, I don’t have to drop everything to see who is calling. I just wait and listen and then decide if I’m answering it or calling the person back later. For someone who screens her calls (Yes, I admit I do…), it’s perfect! With the Call Block feature, you can block up to 100 numbers. I know exactly what I’m using this one for. I get multiple telemarketers calling our house every week. Normally they tell me that I’ve won a dream vacation or that I can lower my interest rate on my credit card. Some of them call multiple times and don’t give up. I’m adding them to my unwanted callers list so I don’t have to listen to their annoying recorded messages anymore. 7. Doubles as a baby monitor. My girl’s aren’t babies anymore, but I wanted to mention this cool feature for those of you that use a baby monitor. The phone has a Baby Monitor feature that will alert you on your smartphone or tablet when your baby is crying. To use this feature you will need the added handset (Model No. KXPRWA10) so that one can be placed in the baby’s room and set to Monitoring Mode. The monitored handset will not ring when in this mode. That is good to know since you wouldn’t want to wake the baby with the phone ringing. 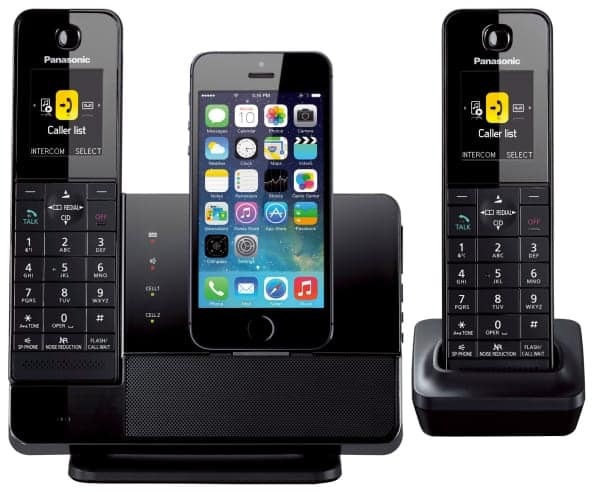 Have you ever seen a cordless phone offer so many unique features? Its been a dream to use so far and we are loving our new phone! After using the Panasonic DECT Premium Design Series phone, I don’t think I could ever go back to our old model. Our new phone has so many great benefits and we appreciate the technology, function and design that this particular model has to offer. It has an SRP of $169.99 which is an excellent value, in my opinion! Check out the other models in the Panasonic DECT’ Premium Design Series and find one that fits your family. I couldn’t have found a better phone to suit our family’s needs! What is your favourite feature of this Panasonic Premium Design Phone? Like the baby monitor feature! I love that It’s stylish & functional. Fave feature – smartphone connect. Hope I win, our phone just went on the fritz! 6. Block unwanted callers << this. I like that Smart Phone Connect has built in WIFI that allows me to use my smart phone as a base.This is a very cool phone that has a lot of features to love! i love the sleek design and all the cool features it has, i would love this!! This is perfect for me. Love the options.